The latest advance in prosthetics shows us both the marvels of medical science and how close we are coming to a tipping point where replacement body parts will become a cosmetic extra; a bit like botox. If you are worried about crows’ feet, sagging skin and feel injections of botulinum toxin could do the trick and you can afford it then you are likely to pay for it. Is it such a stretch to imagine that if you’re hand has a bit of arthritis and there’s a bionic hand on the market and you can afford it that you might pay for it? With most medical advances comes a moral dilemma. Botox was principally used to treat muscle spasms around the eye and only got elevated to the beauty industry when a Canadian husband a wife eye specialists noticed that patients kept volunteering for more injections even though their condition had been cured. Dennis Sorenson, who lost his left hand in a firework accident nine years ago, can now feel objects for the first time thanks to the Life Hand 2 that was fitted in the Gemelli Hospital Rome on January 26. Electrodes embedded in his arm carry signals from sensors in the prosthetic hand to the 36-year-old Dane’s brain and will revolutionise his life. Not only does it feel good, but it looks good. And it would be quite easy to imagine the ‘Want One Of Those’ brigade muscling in on the technology to enhance and prolong their lives. This, like other incredible step changes in medical science, could become almost a fashion choice at some stage. Far-fetched? Maybe, but does anyone really believe that there aren’t people with the money to do this? 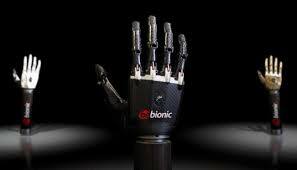 Touch Bionics (http://www.touchbionics.com/products/active-prostheses/i-limb-ultra/) is marketing the i-limb ultra which has the staggering capability of a varied grip so the hand can clutch onto a heavy bag as well as perform delicate manoeuvres such as tie-ing a shoelace. It is the result of amazing talent, dedication and investment and the company is not alone in promising better, more responsive models in the future. All this will mean that people whose lives have been devastated by injury and illness can be helped. But if technology can rebuild body parts and recreate basic human instincts to promise a better life, the output could easily and quickly jump from clinical need to cosmetic desire. In 10/20 years time, we could be meeting octogenarians with wrinkle-free faces and an iron hand shakes. Can we ever beat eating disorders? What is the most important element of a perfect heart health system? A mental health story where cuts are a good thing!